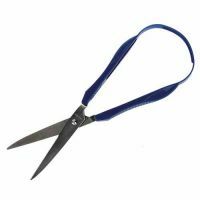 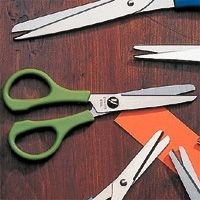 This sections lists a range of scissors that are useful for crafts such as cutting paper with other more specialist scissors for dressmaking and embroidery. 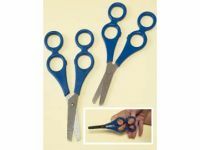 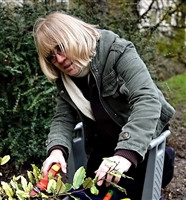 These include: self-opening scissors which have a sprung handle to open the blades automatically ready for the next cut; large handled scissors; training scissors which have four finger loops instead of the usual two, so that an assistant can guide the user when cutting; left handed scissors; and soft touch handles. 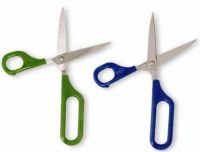 Scissor skills are generally developed in childhood over a period of time by starting initially with simple exercises and then moving to more intricate projects. 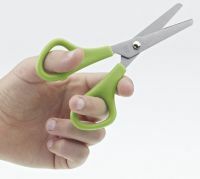 This may be helpful and a useful approach if you have the use of one hand only and are becoming accustomed to using, for example left hand scissors for the first time.